I just love saying the word "cacao"! I mean really, don't you? But, more than saying it, we love to eat it! This is the time of year you will be bombarded with loads of unhealthy chocolate recipes. Those recipes are often loaded with heavy creams, refined sugars, and added fats. Well, slow down missy! No need to add any of those ingredients to an otherwise healthy food!You may be asking yourself, what is the difference between cacao and cocoa. Well, I'm here to break it on down for you!Cacao vs. CocoaRaw cacao: Cacao is the true form of chocolate. Cacao nibs (I know it's a funny word!) are ground up pieces of whole cacao beans, containing the whole nutrition of the bean, without any additional processing. The outer part of the cacao beans, is comprised of fat, and is often removed to create cocoa butter. Cacao powder is raw, and made by cold-pressing un-roasted cocoa beans. You can purchase it on Amazon, or usually in the organic section of your grocery store. Cacao nines, are ground up bits of the cacao seed, before they're turned into a powder. 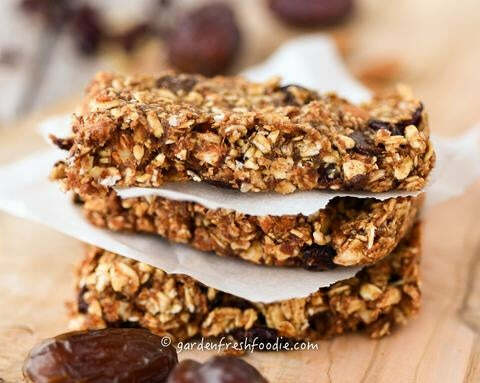 I use them in place of chocolate chips sometimes, like in my Craisinut Granola Bars. Cocoa powder differs, in that it takes the raw cacao and roasts it in its processing. In heating the cacao, the cocoa powder loses some of the powerful antioxidant beneficial enzymes that the plant possesses. Dutch-processed powder has been processed with an alkalized solution, making it less acidic and richer in taste, and appears darker. Raw cocoa powder retains a more acidic nature and bitter taste, and is used in baking recipes with baking soda where Dutch-processed cocoa powder is not since it has already been alkalized. All 4 forms of cacao are good for you, provided they're not combined with added milk solids and sugars, as is usually the case.There are great health benefits from eating raw cacao, or cocoa in its pure nature, without adding in all of the added sugar and dairy usually associated with chocolate. There are antioxidants in chocolate, called polyphenols, that help to reduce the oxidation of LDL or so-called bad cholesterol, a major risk factor in coronary disease. Additionally, polyphenols inhibit blood platelets from clumping together, reducing the risk of atherosclerosis, hardening of the arteries. It's very high in magnesium, an element your body uses to help to regulate blood pressure, regulating muscle and nerve function, blood sugar levels, making protein, bone, and DNA.Cacao contains caffeine and theobromine, both of which stimulate the central nervous system, stimulate the flow of blood in the brain, and increase secretion of the neurotransmitter serotonin, a "feel good/mood enhancing" hormone. Both compounds enhance alertness, facilitate thought formation, and decrease fatigue. They have been shown to improve mood, lift your spirits, and enhances both cardiovascular function and respiration (source). Perhaps, this is why chocolate has become known as an aphrodisiac. Who isn't more in the mood when they feel good and have their blood flowing more freely? !One of the healthiest way I use cacao is in a smoothie or in a pudding. 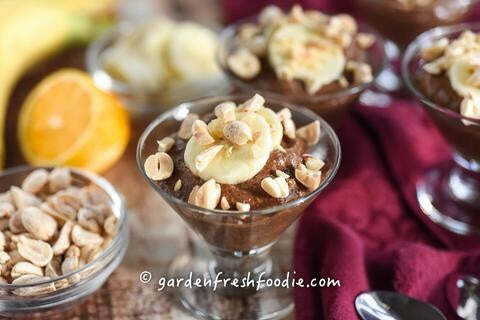 A great way to use raw cacao is in a quick and easy pudding! Combining chia seeds and cacao, you can create a creamy pudding that's rich in flavor, protein, fiber, and antioxidants! How's that for a heart-healthy dessert for your loved ones?! Here's a link to my Chocolate Orange Chia Pudding. 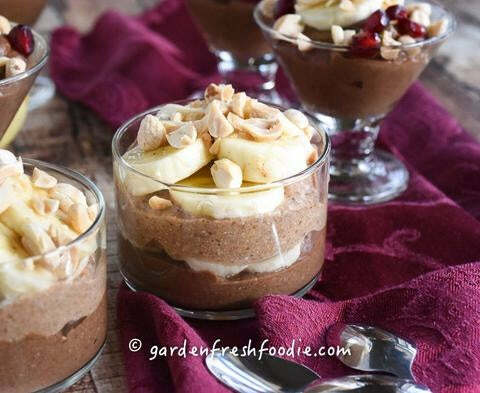 It goes perfectly with my Cinnamon Chia Pudding as a fun layered dessert.